Hello lovelies, Lawson was very kindly gifted products from the new baby care range from HiPP. I was really excited about this! I think they will do so well especially the foaming hand soap, how cute is this? This is Lawson's favourite out of the range and was very happy about the duck, he even says duck duck now which is adorable! 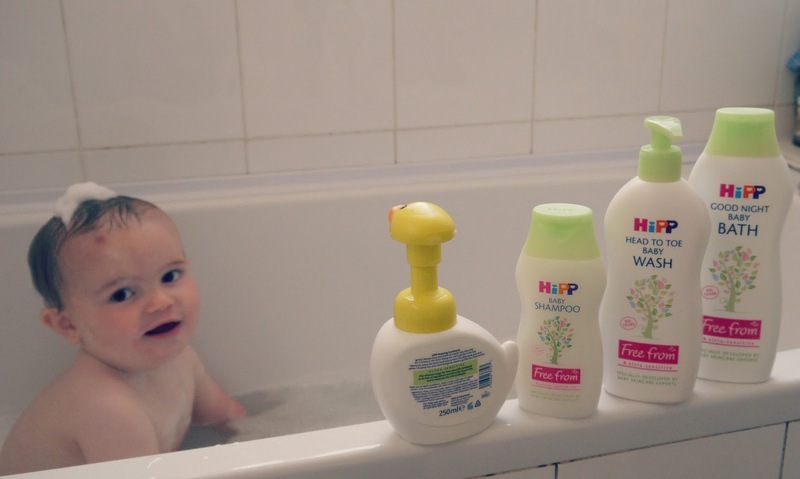 The NEW baby care range from HiPP is 100% ‘Free-from’ nasties with ultra- sensitive, no tears formulations. 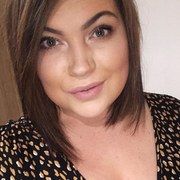 Their skincare range has been specifically developed to be free from anything sensitive skin doesn‘t like; and to minimise the risk of allergies. All of the new bath time items hold the ‘no tears’ stamp. Often used as part of a calm bath and bedtime routine, our new Goodnight Baby Bath contains sandalwood, a calming fragrance. 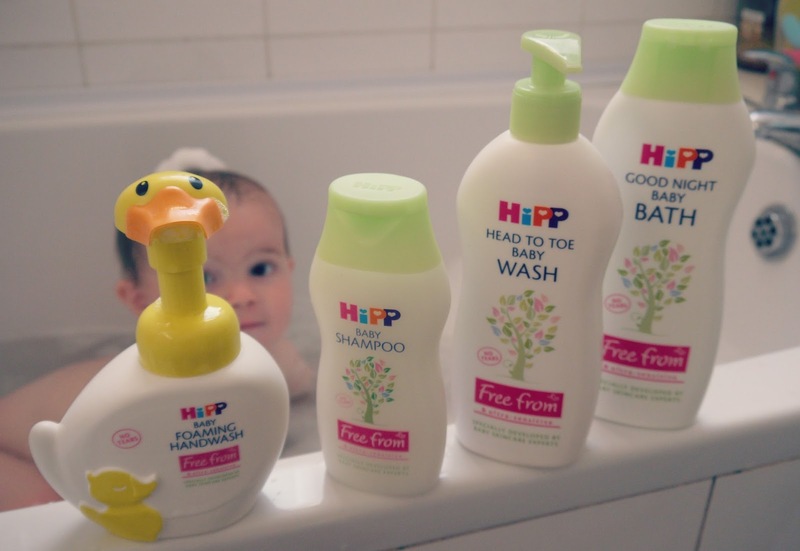 Specially formulated by baby skincare experts, the HiPP Goodnight Baby Bath is free from PEG and parabens, paraffin’s, allergy-causing fragrances and preservatives.  This cute little duck makes handwashing easy and fun for all. The foaming formulation is great for independent toddlers. Free from PEG and parabens, paraffin’s and allergy-causing fragrances.  This wash is perfect from first bath until a separate shampoo is needed. A baby wash is the most popular bath time product with mums, but this one is like no other thanks to its special formulation which is free from nasties, including PEG, parabens, Acrylat-polymers, preservatives and any allergy causing fragrances.  This new shampoo is specially made to be extra gentle and delicate on hair and heads. Free from anything sensitive that skin doesn’t like, this ultra-sensitive shampoo is free from PEG and parabens, paraffin’s, allergy-causing fragrances and has the ‘no tears’ guarantee stamp. I adored the smell of all the products and have even tried the goodnight baby bath with added calm, because I had to make sure they was ok right? It made me feel so much calmer and gave me a really good nights sleep and made my skin feel so soft and lovely, I have always been lucky with my boys having good sleeping routines but I'm sure this would help massively for children who don't! They are all so affordable too, I think great value for money! The foaming hand wash is a must for any childs age! My son Oscar also loves this hand wash and he's almost four, I think any child likes a good gimmick like this, it makes it fun to wash your hands which is a bonus alone. I will forever be buying the refill now and keeping this duck. We need a name for him?? I would highly recommend this range to my friends and anyone with children reading this, my favourites being the hand wash and the goodnight baby bath from the range. I also noticed that Lawson still has that baby like smell and I don't if it was this range that made it come back to me. I also noticed his skin hasn't dried out at all using these products so you know they don't contain any extra nasties like they claim. Thank you so much HiPP it is always a huge pleasure to work with them, I am a massive fan of their new products. I know choosing your baby milk is a staple and you don't change that if you haven't been a HiPP milk buyer definitely try out their new baby care range it really is amazing. Awww this is just so cute Paige! Lawson looks like he's enjoying the products. Adore your mummy family posts you have the cutest family ever.